Breaking news! There’s been a new salvo in the great North American War on Cars. This time it’s yet another biased hack job of a “study” claiming U.S. cities have too much parking, a shameless attempt at social engineering promulgated by those reliably anti-car zealots at the… Mortgage Bankers’ Association? Just kidding about the war on cars. There is no war on cars—though there are many of us who object to subsidizing automobile travel to the detriment of other modes of transportation and our communities' collective financial health. The study, however, led by data scientist Eric Scharnhorst, is real, and it does indeed come from the Research Institute for Housing America of the Mortgage Bankers Association. And it provides yet more persuasive evidence of what you already knew if you’ve been reading Strong Towns for a while: we have built way too much parking in this country, and it is a huge drag on the fiscal solvency and the vitality of our cities and towns. Scharnhorst’s conclusions are not groundbreaking in and of themselves. Other writers have used striking visuals and clever guesswork to convey the same basic idea presented in this new study. For example, back in 2016, Shane Phillips gave us this memorable visualization of what it would look like if all the parking in Los Angeles were assembled into one giant, city-devouring circle. Strong Towns' own internationally recognized #BlackFridayParking campaign each year aims to demonstrate that America’s retail establishments have more parking than they need, even on the busiest shopping day of the year. Based on this and other work, we support an ongoing campaign to encourage cities to eliminate their parking minimums, complete with a map to track which places have taken that long-overdue step. 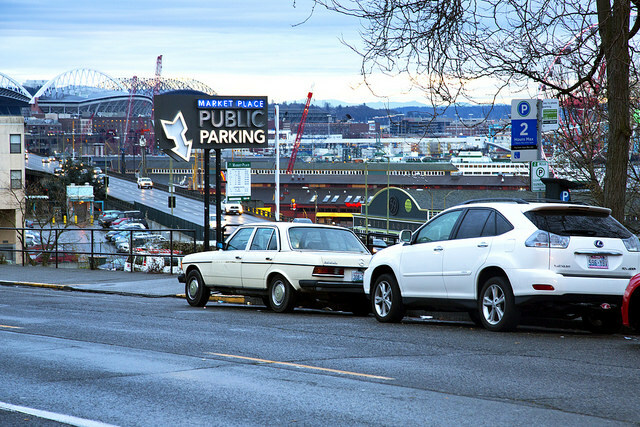 Parking in Seattle, where parking spaces outnumber residents more than 2 to 1. Source: Daniel Foster via Flickr. Creative Commons license. The MBA's study methodology, however, is more rigorous than much of the work that’s been done on this topic in the past. Researchers combined available public data from five U.S. cities—New York; Philadelphia; Seattle; Des Moines; and Jackson, Wyoming—with sophisticated analyses of aerial imagery and even heat signatures to identify both public and private parking spaces. The study is explicitly designed to serve as proof-of-concept for a methodology that can be applied in more places. Parking in Des Moines has a total replacement cost (i.e. what it would cost to rebuild all of it from scratch today) of $77,165 per household, or 60 percent of the cost of the median-priced home in Des Moines. Seattle has a population density of 13 people per acre, and a parking density of 29 parking stalls per acre. That's more than 2 parking spaces per resident (including even young children) citywide. Jackson has over 100,000 parking spaces, whose eventual replacement cost is a staggering $192,000 per household. The study connects the dots not only between all this parking and the enormous long-term maintenance liability that it poses to cities, but also to the enormous opportunity cost that all that asphalt represents. This isn’t just land where we’re storing cars. It’s land far in excess of what we need to store our cars, even at current levels of vehicle ownership. What else could we do with that public space? The whole study is worth a read. Meanwhile, over at Streets.mn, Chris Moseng’s article “A Modern City for People Would Devote Less Space to Cars” raises an even broader question of opportunity cost. What else, he wonders, could we we be doing with all the land devoted not just to parking our cars, but to moving around in them? Moseng estimates the space taken up by cars in motion, based on their speed and stopping distance. A parked car has a footprint of about 170 square feet, but it needs room to maneuver, and a city in which people drive needs more than one parking space per car. A moving car at 30 miles per hour, including the minimum safe following distance ahead of it, takes up at least 750 square feet. For many of you, that’s likely more square footage than you have per person in your own home! Every square foot of land devoted to parking could be used for something else. The land in the public right of way that is devoted to parking could be used for other, more sustainable modes of transportation, or for simply having narrower (safer, calmer, more human-friendly) streets, greatly reducing the cost to maintain those streets and creating more space for recreation and for just being a person outside of a car. And private land could be used, instead, to house people. A landowner could replace a two-car garage with an ADU—and use that land to generate income and provide much-needed new housing units rather than store a depreciating, costly personal asset. Or, that space could be used to provide services people need (e.g., childcare, a neighborhood grocery) closer to where people live, so they don’t feel compelled to drive somewhere else for them. Or, just for quiet enjoyment, not in a car. One important implication from Moseng’s argument for the tech geeks out there: autonomous vehicles won’t change this math very much. They might take up slightly less space while in motion, because they can maintain a shorter following distance — but not if the street is shared with human drivers. And they will still need to be parked somewhere at times of lower demand. The bottom line remains: cars take up a lot of space. And look: cars are also useful tools. The point isn’t to demonize cars, or drivers, or those who are concerned about having a place to park. The issue is to suggest that there’s a better way to organize our cities. We are drowning in asphalt, in concrete, in long-term maintenance liabilities we have no idea how we’re going to pay for. If we can free ourselves, little by little, from car-dependence—not from the existence of cars—we can live in places in which we’re able to meet more of our needs in ways that use resources far more economically. That includes walking, cycling, riding transit, and maybe even scooters. We can do this by returning to the traditional development pattern: places built at a scale that is welcoming to humans on foot, not just in cars; and places that are fiscally productive because they make prudent use of a city’s most valuable and finite resource: the land under our feet. We can do this by continuing to grow the movement to build strong towns. No, your town doesn't need more parking. It probably needs less. When it comes to drunk driving, America may have a bigger driving problem than a drinking problem.